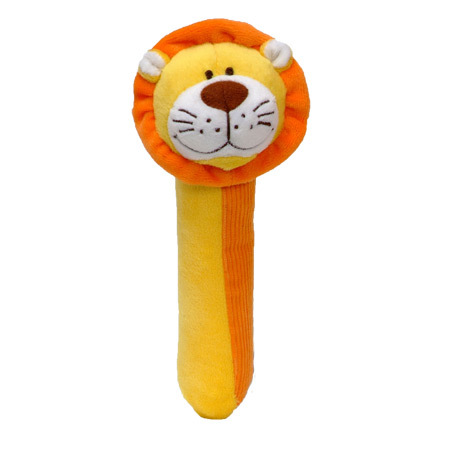 Product Page - Lion Squeakaboo! Crafted from vibrant and soft plush fabrics, each Squeakaboo has a cute shaped face with a kind, gentle smile. Perfect size for tots, babies will instantly warm to the Squeakaboos, and will love to touch, hold and shake them! And when they do, theyll be enthralled by the jingly rattle and squeaker sounds. And whats more, once they start to explore the Squeakaboo, they will be further fascinated by the crinkle-sounding material sewn into the head. Squeakaboos. An ideal first toy for cot, playmat or in the carseat, Squeakaboos are adorable little first friends that will captivate and help encourage babys first discoveries. Great for playing peek-a-boo! ; even the adults can join in the fun! Squeakaboos make a fabulous baby gift and attached, you will find a gift tag ready to be filled in (if you can bear to give it away). Available in bright vivid colours as: - Giraffe, Elephant, Lion, Penguin, Monkey, Cow, Sheep, Duck, Pig, Dog and Cat and as Cuddles style, with natural undyed soft fluffy fabric: Mouse, Sheep, Dog, Bear, Chicken and Duck. Available individually or as gift sets. Squeakaboos measure approx 18cm high, and can be machine washed at 30 degrees. Product Feedback for Lion Squeakaboo!